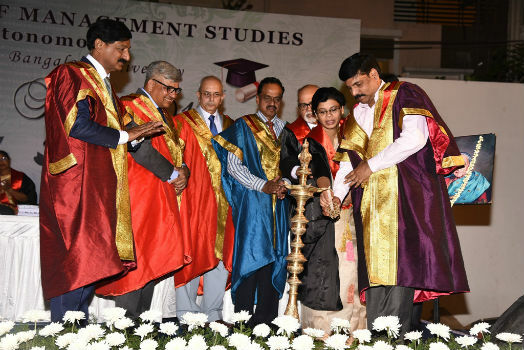 Bangalore: CMR Institute of Management Studies celebrated Graduation Day 2018 at the premises of the institution on 26th of March 2018, Monday. Over six hundred students from various Under Graduate and Post Graduate programs were graduated. The evening began with a melodious rendition invoking the blessings of Lord Ganesha which was complemented by an enthralling dance performance. Addressing the students the chief guest of the day, Shri. Kamal Bali President & Managing Director, VOLVO India Pvt. Ltd said, “Change is only constant in life and we have to keep ahead of the change in order to be successful. One must have a pragmatic and determined goal in life to achieve their dreams and should shun pessimism from their lives and also cut down threads that hold them down”. He congratulated the graduating students and wished them a bright future ahead. Academic Toppers were felicitated with the Academic Excellence Awards. 14 students from various Under Graduate and Post Graduate Programs were felicitated for their extra-curricular activities and those who had demonstrated exemplary leadership skills throughout the year. An atmosphere of pride, happiness and excitement prevailed punctuated with rounds of applause, as students went on stage to collect their awards & certificates. The lighting of the lamp and the oath taking ceremony will be memories cherished in the hearts of the students. The event ended with the students looking forward to a challenging future ahead.